There’s nothing more satisfying than a hot bowl of chili when you come in out of the cold. Throw in some diced jalapenos or other chili peppers and make it even hotter and spicier. You’ll warm up in a hurry! According to one study, if you like your chili spicy, you may even live longer. In a recent Chinese analysis of spicy food, over 16,000 people were followed in the course of 23 years. The study found people who ate hot peppers on a regular basis had a 13 percent reduced risk of dying early. Some people crave spiciness in their food and add chili peppers to everything from scrambled eggs to their hamburgers. The ingredient in hot peppers that gives it a kick is called capsaicin. Its anti-inflammatory properties aids in disease prevention. It helps coronary blood flow and prevents obesity. Science Daily says, chili peppers can even affect your gut in a healthy way by altering microbiota. Adding chili peppers to your diet is a great way to start out a new year of eating healthy. How to Eat Hot Peppers? If you want to begin adding chili peppers to your diet, it is recommended to start slowly. Eat milder chili peppers first, such as the poblano chili pepper, the mildest of hot peppers. Remove the stem, seeds and veins where the most spiciness is stored. Try a few diced into your scrambled eggs. Experiment with soups, stews or stir-fries. If it proves to be too hot for your tongue, take caution not to drink water which spreads the oils in your mouth. Instead, drink milk with it, or add some sour cream to your chili or soup to tame the heat. If you find you like the heat, jalapenos are the most popular with a medium heat. 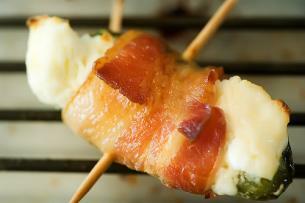 A great appetizer is a jalapeno coated with cream cheese, rolled with bacon and roasted in the oven. If you’re brave, try the habanero – the granddaddy of hot peppers. There are hundreds of types of hot peppers from very mild to diabolically hot. There is sure to be one that fits your taste buds. Even adding a few peppers to your dishes weekly will benefit your health in the long run and may even increase your life!